Attribution is defined as the act of attributing credit to different points of contact along the user journey. It’s used, among other things, to efficiently coordinate marketing campaign budgets – the amounts invested in content, SEO and any other optimization activity your company engages in. In short, attribution analysis tries to respond to that age-old question: which of your initiatives contributes most to helping you achieve your business goals? Jean-François Renaud explains attribution using the example of a shoe store in this article. Personally, I prefer the hockey team analogy. Who should get the most credit when the team wins? The offensive player who scored? The defensive player who stole the puck? The goaltender who stopped the puck? To be fair, you can’t just reward the player who scored, you also have to acknowledge the other players without whom the goal-scorer would never have been able to get the job done. From this you can see that there isn’t just one attribution model but multiple, each with a bias. 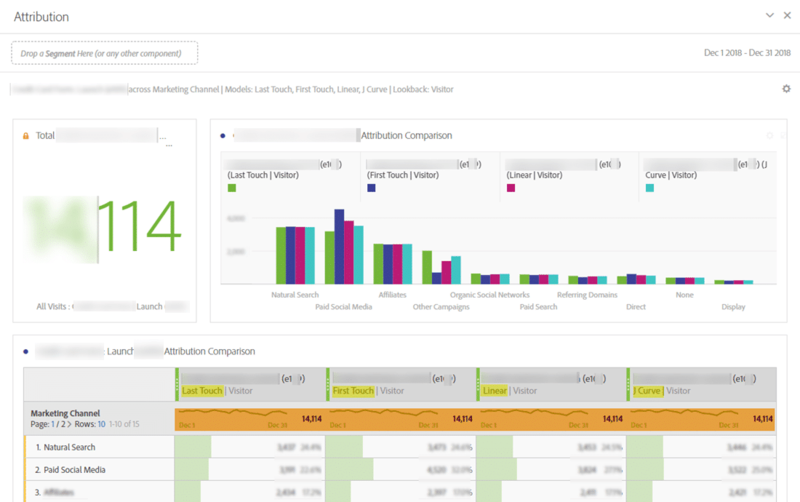 A longtime presence in on-site measurement solutions, the attribution models in Adobe Analytics were previously limited to first touch and last touch. With a default expiration setting of 30 days, it was sometimes complicated to analyze the user journey as a function of where in the customer journey they were coming from, because all we had access to were the first and last points of contact, but no information on what happened in between. Capturing this in-between required us to perform complex and sometimes costly tasks, either within the platform or via external tools. In the end, another weakness of the majority of the tools on the market was that they offered attribution based solely on transactions. Adobe was able to differentiate itself and better respond to users’ needs by developing a tool called Attribution IQ, deployed in summer 2018. What, concretely, is Attribution IQ? 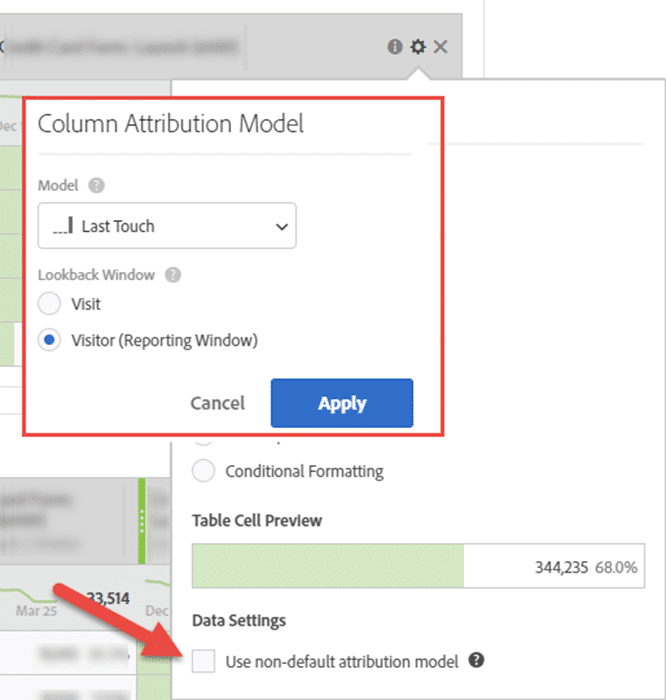 It’s a new functionality available through the Workspace data analytics tool that allows you to compare the attribution of a conversion based on your chosen model. There are two ways to use it; in a table-based visualization, via a freeform table (left), or via the attribution IQ panel (right). The main difference between the two is that the panel builds widgets by default, while the freeform table, which allows for more personalization, needs to be configured manually. One way of using the tool is to build a table using your marketing channels as the dimension and your success events as the metric. Note that the sources here are taken from the default attribution model, the last touch defined by your marketing channels. You then need to click on the gear symbol beside your metric, and check the non-default attribution model box. This is where the attribution model, as well as the lookback window, are chosen, either by visit or by visitor. There are currently ten models available, one of which is custom. 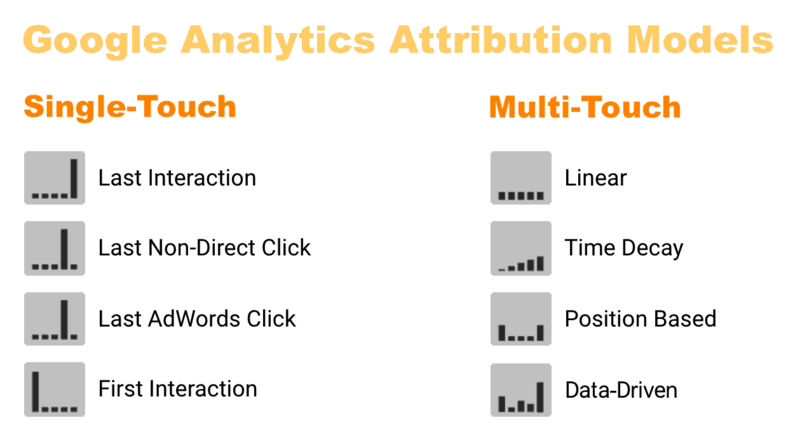 Once you’ve completed these steps, each column will present your data using the chosen attribution model. One option is to compare them all. 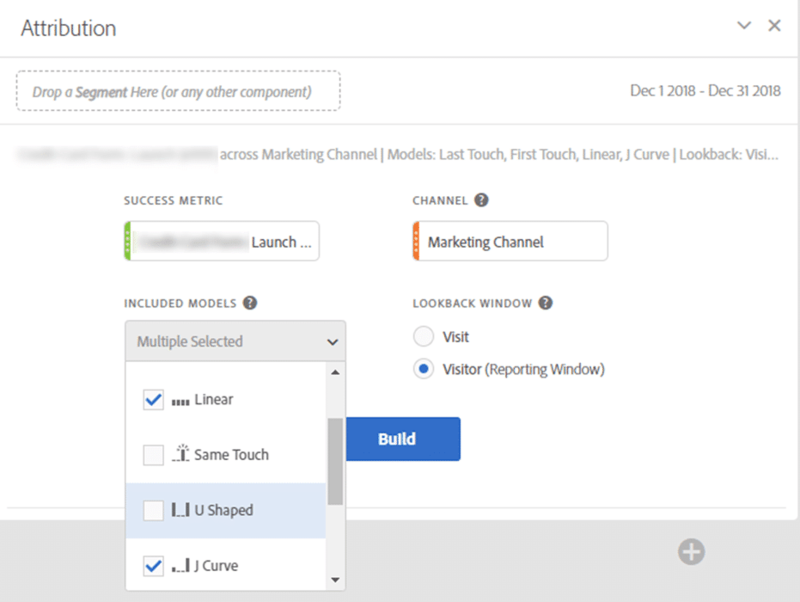 With the dedicated panel, you can let Workspace guide you – all you have to do is select, as with freeform, the scope (visit or visitor), and choose the relevant attribution models. The line highlighted in orange in the above image displays all the conversions. 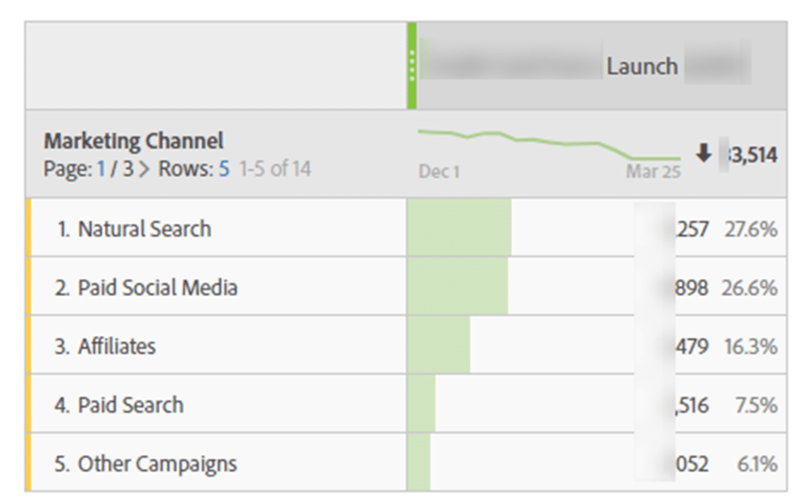 The lines below show the credit given to each traffic source based on the chosen attribution model. In conclusion, Adobe Analytics has created a tool that brings together power and flexibility. 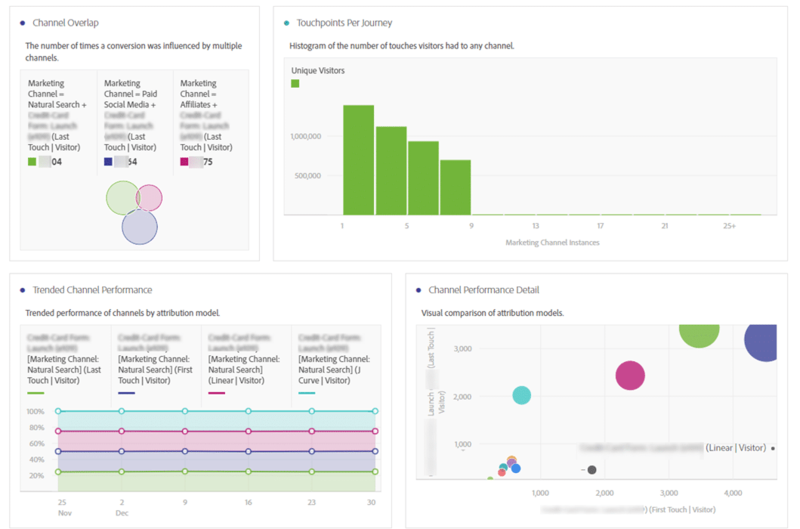 Do you have questions on this new offering from Adobe Analytics or on attribution in general? Don’t hesitate to contact us!